An old friend of mine visited me the other day. When I started designing homepages back in 1995, this friend helped me quite a bit. He has been working as a system engineer since then, quite successfully, and now he wants to explore IT technology that helps the challenged people. He asked me to come up with a new company name and its logo. We talked for about two hours; he talked about the concept of the new company, and I tried to clarify what he was saying. As for the name, I made up a hybrid one, that is, Japanese + English words. 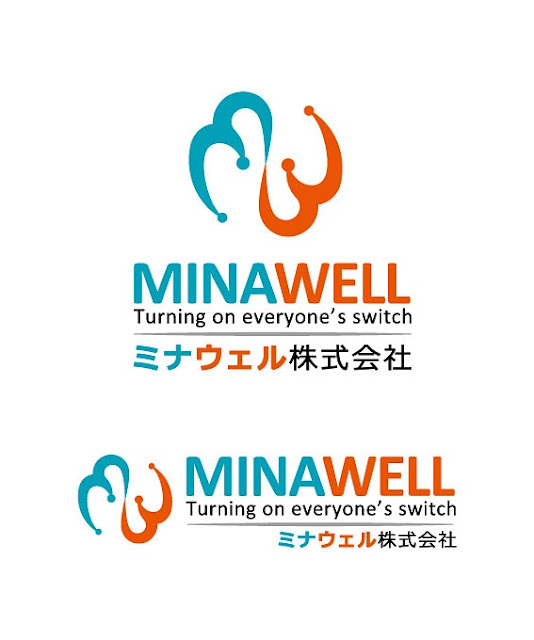 Mina means everybody in JP. Well is, well. As for the mark, I made an organic shape of M, which is turned around to become W. Combined the two in a dynamic form. This is a very creatively done! Logo making is like Haiga making to me. Haiku is my client, and I try to visualize what the haiku wants to say.